Arkansas Antiques Newspaper is printed each month and delivered to Antique Shops, Flea Markets, and Events in the state of Arkansas. Since 1996, Arkansas Antiques Newspaper has been FREE to pick up inside any of our advertiser's shops. While our newspaper is offered at no charge for customers at any one of our distribution points, we do charge for mailed subscriptions. 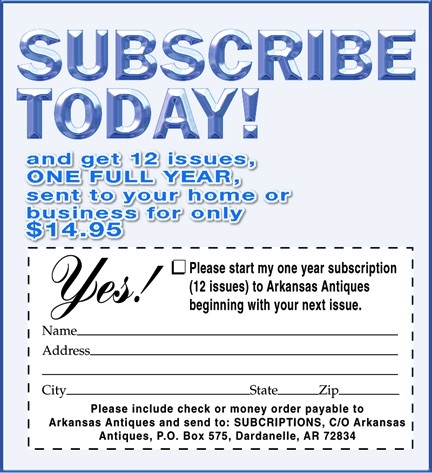 To receive Arkansas Antiques Newspaper in the mail, we offer yearly subscriptions for $14.95 for 12 issues. You can pay by check by mailing $14.95 along with your information and address.